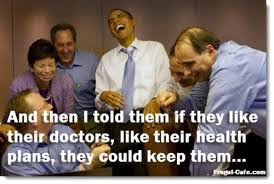 With all the lies already exposed, from Obama’s very public insistence that anyone claiming the Individual Mandate portion of Obamacare was a tax was a liar, until the Supreme Court blew that lie out of the water by saying the only way it was constitutional WAS as a tax, to the claim that is people liked their health insurance plan they could keep it and later finding out that millions couldn’t, one would think those were the worst of the outright lying Obama did before the Obamacare law was passed and signed. One would be wrong as the biggest Obama/Obamacare lie has just been exposed. Section 1311(h)(1)(B) of the health law gives the secretary of Health and Human Services blanket authority to dictate how doctors treat patients. Not just patients in government programs like Medicare and Medicaid, but patients with private plans they pay for themselves. On Dec. 2, 2013, we learned from the Federal Register that the rules are now being written. Starting in 2015, insurance companies will be barred from doing business with doctors who fail to comply. The rules will be offered in the name of ensuring “health-care quality,” which of course could mean anything. In the videos below we see that doctors are concerned over a number of aspects which they are publicly stating will affect their relationship with their patients and patient access to their doctors.